“Fahrenheit 11/9” (2018). Cast: Michael Moore, John Podesta, Bernie Sanders, Alexandria Ocasio-Cortez, Michael Hepburn, David Hogg. Archive footage: Donald Trump, Hillary Clinton, Bill Clinton, Barack Obama, Steve Bannon, Jared Kushner, George W. Bush, Jeb Bush, Nancy Pelosi, Steve Bannon, Gwen Stefani, Roseanne Barr, George Clooney. Director: Michael Moore. Screenplay: Michael Moore. Web site. Trailer. If the title of this film sounds somewhat familiar, that’s because it’s a variation on the director’s previous release, “Fahrenheit 9/11” (2004), Moore’s take on the Iraq War and policies of President George W. Bush. That title is a reference to both the 9/11 terrorist attack and to the novel Fahrenheit 451 (1953) by author Ray Bradbury, a dystopian saga in which books are purposely burned by the state to squelch independent thought, a disturbing trend that Moore believed was fast becoming a reality under Bush’s leadership, justified by inflated national security considerations to intimidate the citizenry into quiescent, docile conformity. 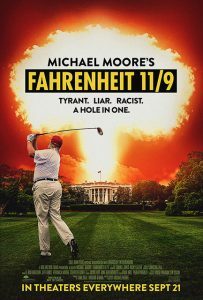 The filmmaker’s latest work, “Fahrenheit 11/9,” mimics the title of its predecessor and contains a reference to the date in 2016 on which Trump was declared the victor in the presidential election. That date also marked the launch of what Moore saw as an administration whose policies and practices were built upon the same principles addressed in his previous film. As the director contends, though, there’s a big difference between what happened in 2004 and what is happening now, chiefly that those policies and practices have been juiced up with a hefty dose of rhetorical steroids. Because of this, the heat has been turned up on the population considerably, making the “Fahrenheit” reference in the title all the more significant – and ominous. It gives us pause to think about what this all means for the future. Through this film, Moore examines how we’ve arrived at this point – the political developments, the social developments and, most importantly, the behind-the-scenes maneuverings that have led to our current situation. And the answers to the picture’s central question are eye-opening, revelations that show there’s plenty of blame to go around, some of it attributable to sources that might not be readily apparent, especially those most ardently opposed to the Trump presidency. In telling this story, Moore addresses a number of subjects, including some that seem somewhat unrelated to the film’s central narrative, such as the Flint, Michigan water crisis and the West Virginia statewide teachers’ strike. However, as important as these ancillary issues are, they tend to take the focus off the picture’s central thrust, clouding matters and creating a scattershot message that comes across as disjointed at times. Ironically, though, when the director stays on point, he turns out what is arguably some of his best work. Unlike his other projects, this time the diehard liberal filmmaker doesn’t hesitate to criticize the real source of the problems with the current American political system – the system itself, not right nor left, Republican nor Democrat but the whole stinkin’ system. The Trump election, in his view, is a symptom of a larger problem, and that’s what needs to be addressed. In this regard, then, it’s heartening to see a picture that finally say what’s really wrong with things, to unequivocally say that the emperor is indeed naked, no matter what color cloak people might like to believe he’s wearing. Because of that, this is a picture sure to offend viewers on both ends of the political spectrum. But then maybe that’s what needs to be done to get the ball rolling toward meaningful change instead of incessant rounds of futile and unproductive finger pointing. It’s not a case of “the other side” causing problems; it’s a case of both sides wreaking havoc to the detriment of the average American citizen. For many viewers, this revelation may well come as a shock (provided they’re paying attention to it, that is). But this message is important, because it’s essential to recognizing where the real issue lies, a realization that’s essential for identifying where to start in bringing about change. To make that happen, though, we need to do more than just recognize the source of the problem. We simultaneously need to change our outlooks, the beliefs we hold about the process of governing and addressing society’s needs. And that’s crucial, because those beliefs provide the foundation for what materializes. This is the cornerstone principle of the conscious creation process, the means by which we manifest the reality we experience through the power of our thoughts, beliefs and intents. While Moore doesn’t address these matters on point, there’s certainly an implication here that, if we want to invoke change, we need to be the ones to start implementing it. We need to draw on Gandhi’s famous recommendation that we should seek to become the change we wish to see in the world. And, if we want to do that, we must first look to the beliefs we employ to bring about such a result. In practical terms, this involves eliminating outmoded beliefs that no longer work, such as blindly placing our faith in those who are running the current power structure. Beliefs that those individuals will take care of us and work for our best interests – regardless of their party affiliation or ideological background – need to be purged, because the track record evidence clearly indicates that’s unlikely to happen. Ridding ourselves of such naïve, Pollyanna notions is essential if we ever hope for things to be any different. Indeed, it really is time to wake up and smell the proverbial coffee. In tandem with that, we need to embrace beliefs about holding on to our power rather than giving it away to those who don’t have our best interests at heart. Allowing that to happen has played a huge role in how things have evolved to the state we’re currently in. The time has come to take our power back. Given the oppressive nature of where matters stand, however, some might see such recommendations as overly optimistic. And, to be honest, reversing present circumstances may not be easy or quick. But, based on some remarkable initiatives that Moore cites, that need not be the case. Drawing upon such examples as the favorable resolution to the West Virginia teachers’ strike (a movement that has since spread to other states), the nationwide student-led gun control protests in response to the Parkland, Florida high school shooting, and the rise of citizen politicians defeating well-heeled incumbents in recent primary elections, Moore presents viable solutions that can, in fact, work. In each of these instances, these programs call upon everyday citizens to rise up and take the reins to fix things, efforts requiring determination, patience and tenacity. But, based on the kinds of results that are truly possible, such measures represent valid, worthwhile efforts that could provide harbingers of things to come if we put our minds to it. The question, of course, is, are we up to the challenge? In making this case, Moore has essentially thrown down the gauntlet to the American people. If we’re to prevent circumstances from getting any worse, we need to adopt a realistic view of our situation, embrace beliefs free of foolhardy wishful thinking and take back the power we’ve wastefully squandered. It’s a significant challenge, one that we’d better take seriously. If we don’t, we risk a lot, including potentially having to ask ourselves “What happened?” all over again. As important as this message is, though, it’s unfortunate that it sometimes gets bogged down in the telling. Moore’s signature showmanship, along with his inclusion of too much extraneous material that obscures his primary contentions, combine to hinder the clarity and effectiveness of his execution at times. A little judicious editing, as well as some restrained tempering of his infamous on-screen antics, would go a long way toward getting the word out better. But, to his credit, he definitely deserves kudos for bringing this message to the forefront of the public’s attention. Let’s hope we’re taking heed of it. To be sure, the evidence Moore offers about his subjects is quite damning. Yet, at the same time, there’s an implication here that we played a part in how events unfolded, a role we can’t truthfully deny. The filmmaker illustrates what can happen when we allow our vigilance to lapse and let things slip through our fingers. If we don’t want a repeat of these actions, we need to proactively take charge of our circumstances, diligently implementing beliefs that set us on a new course – and keep the heat from getting turned up any further.